Last weekend, John and I came back to b-ville to spend time with my Mom and brother who just returned from Alaska. We didn’t have any big plans for the weekend, but we all usually try to get together for dinner with family. Luckily both my grandparents, my cousin Johnny and his girlfriend Val were able to make it over. Of course I think of this as a great excuse to make a fancy meal I wouldn’t normally make for just the 2 of us and to have 8 guinea pigs to try it. It happens to help that my brother returned from Alaska with over 12 pounds of halibut for me to put to use! While it got kind of late in the evening to try to photograph the whole meal, this appetizer was one of the first things we enjoyed on Saturday (of course this came after my grandparent’s favorite – Manhattans). I have to admit I overdid it on the garlic in this recipe – you would’ve thought we were trying to keep vampires away. Sometimes more is not better, so I would recommend sticking to the 1-2 cloves of garlic indicated in the recipe. I think my favorite thing about this dish was the presentation. It looks like art but truthfully takes less than 10 minutes to put together. In order to save time (and because I mis-read the recipe :-)), I skipped the step in which you blanch the basil. It still turned out beautifully but if you want a truly stunning green color, blanching would be the way to go. I also left the basil leaves in the oil but for a smoother texture you can strain them out with a fine mesh sieve. Pulsing the basil in the food processor should’ve flavored the oil sufficiently that they are not necessary in the final dish. 1. 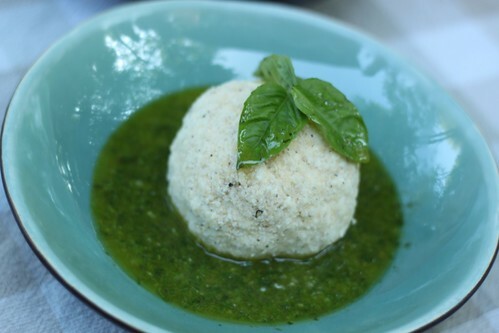 In the bowl of a food processor add the block of parmesan cheese and pulse until finely grated. Add the panko and pulse to combine. Season with pepper. Transfer mixture to a separate bowl and wipe out the bowl of the food processor. 2. With a fork, smash the garlic and salt together. Add garlic/salt to the goat cheese and sir to combine. Form the goat cheese into a ball and roll in the parmesean-panko mixture. Wrap in plastic wrap and refrigerate until ready to serve. 3. If blanching the basil: Bring a few cups of water to a boil. Add the basil leaves to the saucepan and boil for 30 seconds. Drain and rinse immediately with cold water. Blot the basil leaves with a towel to remove all of the excess water. 4. Add basil and garlic to the food processor and pulse. Scrape down the sides of the bowl. With the food processor running add oil until texture is liquidly (you may need slightly more than 1/4 cup). 5. 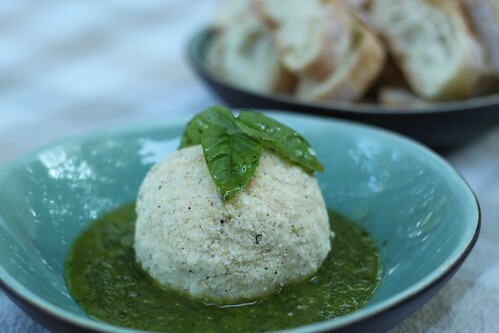 To serve, pour the bail oil onto a plate and top with goat cheese ball. Serve with baguette slices.